Do you want to make a grand entrance or have an amazing drive around the city in a luxury, prestige car on your prom? You have come to the right place, SPM hire provide cars on proms for our young customers to have the best time. We understand students have had a stressful year just before the Prom and want to have an amazing day without any stress, we ensure we do all the work, Our chauffeurs are fun, punctual and make sure customers get satisfaction from their hire. 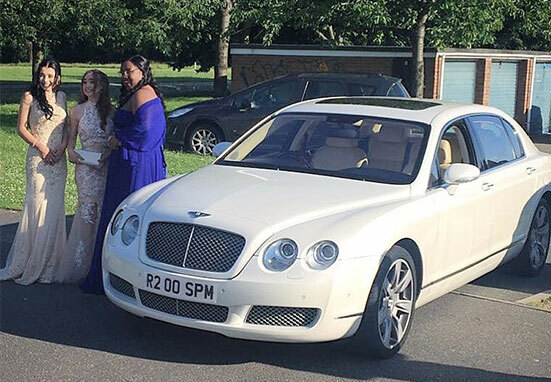 We have a range of vehicles which will make your day enjoyable and memorable, luxury cars such as Rolls Royce Phantom, Bentley Flying spur, Porsche Panamera will really make you stand out when you make your entrance. Want to be the centre of attention, want to make some noise on your entrance? Why not hire our AMGs for the day. Ranging from, Mercedes G63, E63, C63 we have all the power at SPM, any of these cars will be perfect for your prom hire, ensuring everyone knows that you have arrived and making sure the rest of your day will be as fun as possible. These are just some of the selection we have at SPM. Our professional chauffeurs will make sure you have an enjoyable day, where you can have as much as fun as possible experiencing an amazing drive in one of the luxury cars. Our prices are competitive and ensure you get the best service and value for money. To ensure you have the perfect car for your prom why not visit our showroom, look at our luxury cars beforehand and choose for yourself. To avoid disappointment on your big day we want to ensure you are completely satisfied with your choice, see how it looks, see how it sounds and make a booking with our professional team who will guide you and answer any questions you have regarding the vehicle or your booking.